The American Metalcraft MELSQ53 Endurance™ bowl gives tabletops a unique look with its square shape, while the white color works well with many design schemes. 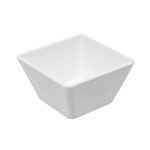 To provide break resistance, the dish is made of heavy-duty melamine. When serving acidic, citric, or brightly-colored food, a PBSL53 disposable liner should be used to prevent staining. The American Metalcraft MELSQ53 Endurance bowl is not safe in the microwave but can be placed in the dishwasher.